Artists play an important role in deepening our cultural imagination in a way that helps us to see and understand how religion is returning as a social and cultural force to be reckoned with and celebrated. Blake Society Chair Rev Dr Rod Pattenden has written about the power of religion to maintain our ‘tribal’ differences while at the same time acting as a resource for dissolving the false boundaries in our society that hold us back from a spirit of ‘generous understanding’ of each other. The announcement of the winners of the Blake Prize for religious art is usually a welcome demonstration of the fact that corporate sponsors recognise the role religious imagination has to play in our society. But the apprehension at Saturday’s event at the UNSW Paddington Campus in Sydney was a sign that this recognition is faltering, and that the 63rd award of the Prize may be the last. Without a major sponsor for the past seven years the prize is in desperate need of a miracle to maintain its running costs of around $60,000. Pattenden spoke about the ‘big hole’ in the Blake’s finances that needs to be addressed. On Saturday the main prize of $25,000 was awarded to Melbourne artist Richard Lewer for his hand-drawn animation that depicts the story of elderly Perth man Bernie Erikson, who survived a failed suicide pact with his wife. Lewer said he wanted to raise questions about euthanasia as a live issue in a way that did not judge the morality of Erikson’s actions. Pattenden described the winning entry as a beguiling work that presents a complex story of love and death in a simple story-like form. ‘It invites reflection and the format is really very beautiful and the soft compassionate voice of the artist leaves us with questions to consider’. 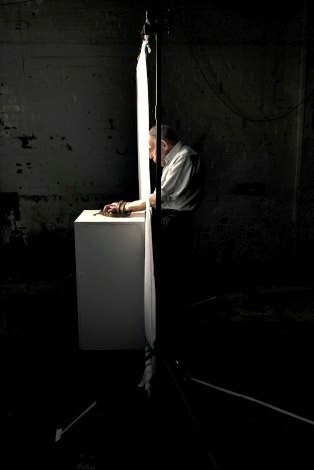 The Blake includes a poetry prize and a Human Justice Award, which was awarded on Saturday to another Melbourne artist – Hedy Ritterman – for her depiction of 96 year old Richard with his hands on a museum plinth holding a belt that is his only possession that survived his World War II incarceration in concentration camps (pictured). Works such as this command our attention and deep reflection, and they defy our society’s demand for commodification. Our fickle politics of the past few years shows that the majority of Australians are prepared to gloss over serious issues such as how to answer the life and death needs of the refugees whose lives have been disrupted by the wars we wage. Politicians are driven by opinion polls, and most corporate sponsors are inclined to follow their lead. The Blake is looking for sponsors and philanthropists that value the asking of difficult and unpopular questions. I am saddened to read about the difficulties the Blake Prize is encountering in attracting sponsors. This is a prize I have taken some interest in over the years. I think spirituality can be a difficult subject for sponsors and philanthropists to grapple with. And there are many worthy, competing voices for philanthropic dollars. I know I'd be willing to help in a small way to secure the financial future of the Blake Prize and I would hope many other small 'fish' would feel the same. Perhaps that's the answer. Maybe the term Mediocrity should be used to discrabe the outcome not expectations. Since it supposed to be "Religious Art Prize"the work should be about religion not out of whack pseudomodern interpretations. The story is short. Religious Prize hijacked be pseudomodern interest and in turn abandoned by sponsors who have every right to expect art actually dealing in positive way with religious message. A sponsor preference for art that is supposedly 'popular and safe' signifies a sponsor desire to champion cliche and platitude. It looks like a sponsor education strategy is called for. It would be a sad day to see the end of this wonderful opportunity for artists to inject some spiritual reflection in Australian society. I have had a mind to enter for some years & with retirement now find myself with time to have a go....what a terrible shame from not only a personal perspective but loss of a great cultural expression. We need 250 people with $100 as a start. Later we focus on minor prizes. Crowd funding could do it. Blake is an Australian institution . I have followed the Blake for many years and have submitted works to the poetry prize, There has been a marked shift in the interpretation of religious art and poetry over perhaps the last 10 years or so. Much is a sop to the liberalisation of secularism - almost as if the promoters and judges are embarrassed by religion, particularly Christianity. Our society is beginning to make the Philistines look positively highly cultured and Western Christianity impotent and meaningless in modern society. A great shame. However, we have ourselves to blame and not least amongst the blameworthy is the Catholic Church which has long abandoned the education of its people. A disclaimer - I have been an unsuccessful entrant for the Blake Poetry Prize. Over the years since 1951 when I had a schoolboy's interest in Art and Poetry, I was particularly rapt in in the works (both poetic and artistic) of William Blake..My English Literature teacher, a minor poet himself, infuriated us by telling us there was no satisfactory definition of Poetry. By defining it we would be limiting it. Poetry, he held, was what poets write. By the same token Art would be what artists painted, carved. etc. Many poets in the canon of English Literature were glorified versifiers. Their verses were not the result of 'a lived experience', whereas Keats, or Blake or Henry Lawson (to name three of his favourites) spoke from the soul and in that sense were poets of the spirit. Many philanthropists do value 'the asking of difficult and unpopular questions'. It is just that the mode in which these questions are asked doesn't appeal to them. So much of modern Poetry and modern Art appears to be self-indulgent and not revealing of any interior religious or spiritual experience. Obscurantism passes for depth. Yes, I was going to come on to say i would be more than happy to contribute to a crowd funding of it. I think it is really important - always makes us think. Perhaps, as several posters have suggested, it is time for the Blake steering committee to reconsider its criteria for what constitutes religious art. I'll advance one: it should be at least suggestive of the transcendent - not, to counterpoint WH Auden, content to "find the human world enough." While the horrible tragedy was underway in Martin Place, a remarkable thing happened. We saw, and continue to see, a powerful sense of compassion in the 'I'll ride with you' spontaneous pledges. One one level it was a simple offer of human support. But it was also a deeply profound declaration of a vision for a just and inclusive Australia. The siege at the Lindt chocolate shop in Sydney's Martin Place is frightening for all Australians. It also obscures the progress of relations between Muslims and other Australians, as such events have such an unfortunate polarising 'us and them' effect.